The delivery checks for open flaps, non-readable addresses, and IMB Barcodes then automatically rejects any letter that should not be delivered. Various reading systems are available for the sima, from simple print mark readers up to a server based OCR/IMB reading system connected to the Digital Front End. Our patented collection unit safely stacks the envelopes individually- without contacting each othermaking twisting or interleaving almost impossible. The envelope stack is quickly pressed before filling the letter trays in accordance with USPS regulations (DMM). The exchange of letter trays occurs automatically with an exchange speed of up to 1,800 boxes/h (2.0 sec). The tray exchange unit can handle MM and EMM letter trays. A unique feature is its ability to intermix one and two foot letter trays depending to the presorting need. As an option, a postcode label printer can be integrated into the sima, which applies a tray label to the letter tray. The filled letter trays are temporarily stored on a large buffer section. The Sequence Repair System (SRS), which marks or separates mails that do not belong to the actual mail sequence, comes standard on this machine. 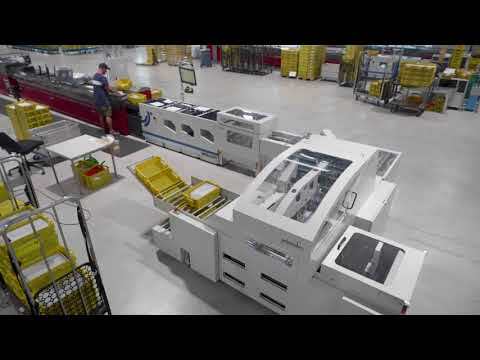 The sima can instruct the operator what to do with the marked or separated mail. This SRS enables a constant production speed even when sequence problems appear. Up to 20,000 envelopes/hour, depending on the quality and size of the envelopes. Postboxes: Deutsche Post, Postcon, Swiss Post, Austrian Post, Belgian Post, Dutch Post, USPS Trays, Pin Boxes, Cartons (without lid flaps) and many more. Questions about the sima? Jan Oldenkott will be happy to advise you.